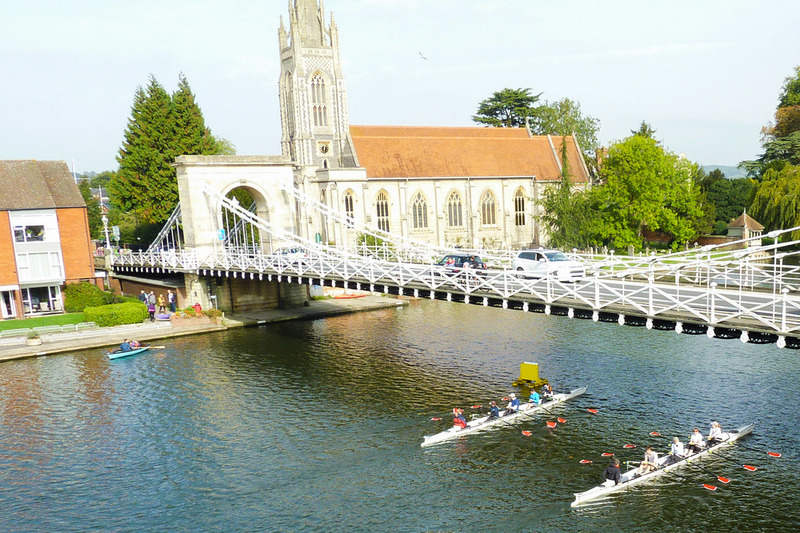 If you love the idea of learning to row but can’t commit to heavy training regimes - or don’t fancy elite competitive racing- then the Explore Squad of Reading Rowing Club is for you. The Explore crew are a growing, vibrant, friendly group who row with an emphasis on having fun. Sculling (an oar in each hand) is the preferred technique. We scull in a mixture of boats depending on numbers and we often row further through the locks to Pangbourne, Sonning and beyond! Recently some of us have been part of some new racing events in the Thames region, and these are set to continue, more details below. Being an Explore member has other advantages: you only need Silver Membership of the Club and British Rowing, so reduced fees. There is no pressure to train, take erg tests or row every week. We are still developing as a squad, so we would love people to join us who can share or add a new dimension to our activities. We even have our own natty Explore club shirts!! Explore is the newest squad at the club and on the cusp of a very exciting future. The winter of 2015 saw the launch of the Thames Valley Explore Sunday Rowing League incorporating ‘Splash and Dash’ races of 250-300 metres and ‘skills events’ held at different clubs, to emulate the highly popular format already established in the North of the Country. Held at Marlow, Molesey and Hillingdon, each club had to race each other in stable boats on a round robin format. Teams were mixed in ability and gender. Averaging out at 6-7 races in an afternoon, and at Hillingdon Lake, the skills event incorporated tasks such as emergency stops, backing down to a buoy, 360 degree turns, rigger dips and square blading, all within a time trial. This has been full on fun, with each host club providing the boats, refreshments and camaraderie! The success of these events, warranted a discussion between all the participating clubs to decide our expanding future. During April 2016, rowing club representatives from our regional stretch of the Thames (from Goring Gap to Molesey) and British Rowing, met at Leander Club to discuss the future of Explore rowing and the further development of the Sunday Rowing League in our region. We have decided to run more Sunday Rowing League events in 2016 with Reading as a host venue later in the year. We have also decided to expand on the ‘Explore’ theme and are currently developing a network of clubs who wish to share ‘Friendship Rows’. By way of our newly formed Thames Valley Explore Rowing Facebook Group, we can informally invite each other for a row to enjoy other stretches of the Thames, inform each other of new events, picnic trips and long tour rows. We are even going to hold Coxing (yes we take it in turns to Cox) and coaching days hopefully at Weyfarers, another of our TVER clubs and develop a cohesive network of like-minded rowers.